Filed to: Holla at Ya Fellow Latinx!Filed to: Holla at Ya Fellow Latinx! Holla at Ya Fellow Latinx! 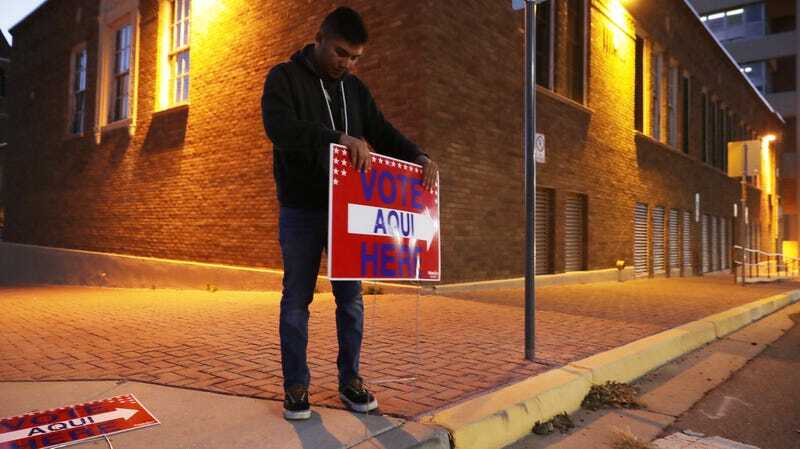 Volunteer Albert Lopez, 18, puts up a Spanish-language voting sign in El Paso, Texas, a predominantly Latinx border town that voted blue this year. Latinx voters know what climate change looks like, and they want Congress to do something about it, according to a new poll. More than 80 percent of Latinx voters in key battleground states and districts found it “very” or “extremely important” that the new Congress take action to combat global warming. That’s 10 percent more than in 2016 when these same districts and states were surveyed. And the reason they care isn’t rocket science: More than 78 percent of these Latinx voters have personally experienced climate change’s effects in their states, per the poll. Latino Decisions, a data research firm, released these numbers Friday after interviewing 2,600 voters in 70 key house races, as well as in the states of Arizona, California, Florida, Nevada, and Texas in the five days immediately before the midterm election November 6. Latinx people made up at least 19 percent of voters in these states, according to the Pew Research Center. This new poll also found that more than 80 percent of voters interviewed viewed it “very” or“extremely important” for Congress to pass legislation that’d help reduce air pollution, including legislation that supports clean energy. These numbers don’t come as much of a surprise. Latinx are known for voting green. The Yale Program on Climate Change Communication published a report last year that shed light on how green-minded Latinx are, especially Spanish-speaking Latinx. Even Republican Latinx lean on the side of the environment, according to this latest poll. More than 61 percent of Republicans polled said it was “very” or “extremely important” to take an aggressive stance against climate change. While the Latinx vote ran blue this election season, that wasn’t enough to create a blue wave in Florida and Texas, two southern states that saw climate change up close and personal last year after Hurricanes Irma and Harvey. The results in Florida, however, are still in contention as the state begins recounts for Senate, gubernatorial, and agriculture commissioner races. Luckily, an offshore drilling ban did pass in that state, and so did an amendment that gives up to 1.6 million felons the right to vote. We already know that black and Latinx are disproportionately incarcerated, so this will mean more black and brown voters come next election season. Sure, some environmental-focused ballot measures failed: Arizona didn’t pass its measure to require utilities to generate 50 percent of their energy from renewable sources, and Washington state failed to pass a carbon fee. But this polling data is the latest indication that public opinion is shifting in favor of climate action. And Latinx voters will play an increasingly big role in that shift. As our population continues to grow, our voices will become louder during election seasons. More-first time Latinx voters showed up to the polls nationwide this year, according to Pew, and a record 2.2 million registered to vote in Florida. Perhaps it’ll be enough for an environmental revolution come 2020.